SEATTLE, Nov. 6, 2018 /PRNewswire/ -- The Adventure Travel Trade Association (ATTA) has published the educational agenda and attending international suppliers, media, and buyers for AdventureNEXT India, a regionally specialized adventure travel industry event being held 3-5 December in Madhya Pradesh. 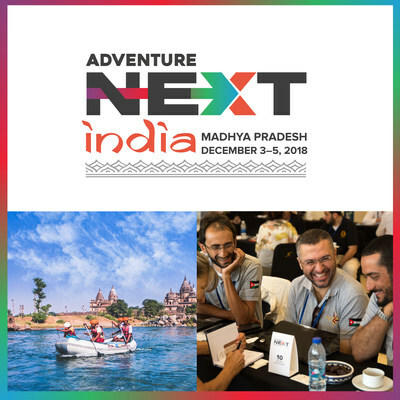 Following its winning formula for similar events held in other international destinations, AdventureNEXT India features expert-led presentations, pre-scheduled meetings with potential professional partners, and a chance for international delegates to experience the country's adventure activities. Based on projections of research from 2009 and 2012, the adventure travel industry has grown exponentially from a $263 billion USD sector in 2012 to $683 billion in 2017, and makes up an estimated 30 percent of global tourism spending. This explosive growth signals an opportunity for India to position itself more prominently in the adventure travel spotlight. One of the highlights of the three-day event is Marketplace, a dedicated time for one-on-one meetings facilitating productive partnerships. Nearly 50 global buyers have registered and will connect with attending suppliers to expand their itinerary offerings; more than 20 media will meet regional representatives for story ideas. These foundational relationships between Indian travel companies and international operators and media offer an opportunity to propel adventure travel growth in the region for years to come. The event's theme, Pulse of Tomorrow, reflects the rich array of content for professionals to hone in on their calling and explore future-driven business opportunities. The agenda features topics such as today's adventure traveler, immersive technology, and branding, while region-specific topics include a deep look at guide standards and the economics of wildlife tourism. "I'm so excited at the possibility of bringing our customers to this region of the world," said Eric Aguirre, a buyer attending AdventureNEXT India representing Under30Experiences. "We're hoping that through AdventureNEXT India we'll be able to form the connections necessary to bring our travel community to this culturally rich country." Tourism companies wishing to connect are encouraged to register soon. Since 1990, the ATTA has been the leading voice and partner for the adventure travel industry. More than 1,300 member organizations including tour operators, tourism boards, specialty agents, and media share a vested interest in the sustainable development of adventure tourism. With specialized expertise in research, events, and education the ATTA's business services and events division, Adventure 360, delivers strategic solutions and a robust ecosystem of global events.